Putin in his Inauguration, May 7, 2018. 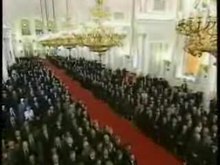 The inauguration of the President of Russia (Инаугурация президента России) is a ceremony to mark the start of the term of the President of Russia. The inauguration is carried out six years (formerly four years) after the inauguration of the previous president. In the case of extraordinary election, the inauguration is conducted thirty days after the announcement of the official election results by the Central Election Commission. Traditionally, inauguration takes place in the Grand Kremlin Palace of the Moscow Kremlin. The inauguration ceremony of the Russian president has traditionally been accompanied by the festive prayer service of the Patriarch of Moscow and all Rus', which dates back to 1498, when the first wedding took place for the reign of Prince Dmitry Ivanovich, the grandson of Ivan III. The ceremony in the Grand Kremlin Palace begins (since 2008) when the presidential military band from the Kremlin Regiment plays the Festival Coronation March by Tchaikovsky. The inauguration proper starts with the outgoing President reviewing the Kremlin Regiment for one last time as President and Supreme Commander of the uniformed forces of the Federation in Cathedral Square and he then walks towards the Grand Kremlin Palace. The President-elect's procession arrives at the Grand Kremlin Palace through the Spassky Gate. The President-elect passes through St. George's Hall and St. Andrews's Hall into Alexander Hall, which holds the flags of the Russian Standard of the President and the Emblem of the Russian president. The Chairman of the Constitutional Court and the Chairmen of both chambers of parliament sit at a raised platform where the President-elect joins them. The Chairman of the Constitutional Court places both Constitution and the President's Chain of Office on the rostrum. After the outgoing President makes his address, the Chairman of the Constitutional Court of Russia then asks President-elect to take the oath of office. The president-elect places his right hand on the Constitution of the Russian Federation and recites the presidential oath. The Chairman of the Constitutional Court then gives the President the chain of office and proclaims the inauguration of a new President. 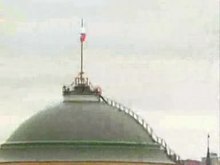 After the new president is inaugurated the Russian national anthem is played and the standard of the head of state is raised at the dome of the presidential residence. This is followed by the new President's speech and as the speech ends and the new President leaves the halls "Slavsya" by Mikhail Glinka from his first opera A Life for the Tsar is played by the military band as a 21-gun salute is fired. As the inauguration has been held every 4 and now 6 years on 7 May, the anniversary of the raising of the Kremlin Regiment, the ceremony ends in Cathedral Square with both the outgoing and incoming presidents attending the latter's 1st inspection of the regiment as the Supreme Commander of the armed and civil security forces of Russia, greeting it on its anniversary. It is then followed by the marchpart of the entire regiment assembled. The Patrioticheskaya Pesnya at the inauguration of Vladimir Putin, 2000. 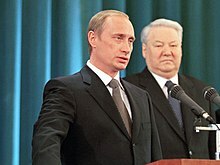 Vladimir Putin taking the Presidential Oath, May 7, 2000. ^ "В день инаугурации президента России патриарх Кирилл совершит молебен". ТАСС (in Russian). Retrieved May 8, 2018. This page was last edited on 6 July 2018, at 17:02 (UTC).